No rain forecast and a good flag flying breeze for the Easter weekend SIT plot meet up. What lucky gatherer will find this seet treasure? Which lucky gatherer will discover this sweet treasure? Next on the itinerary, the seed bomb making. Mixing clay, compost and seeds. Not a bad batch for our first seed bomb cook up. Now dry in warmish place (greenhouse) for a couple of days for super-crispy-explode on impact bombs. Now we have almost depleted most of the seed stocks making bombs we had better get on with the seed swap. Thankfully Danielle an avid grower who runs a small farm in Rochford and her apprentice seedsmith daughter brought a veritable selection to help restock. Good to see old favourites, beans, peas, carrots, but also many unusual varieties ;like Cucumelon striped beetroot and one I am looking forward to to giving a go – multicoloured sweetcorn! Kamil carries out a citizens arrest on me for uncivilised seed hoarding behaviour. After all this hard work, hmm hard play on this occasion, the call of lunch was a welcome one.But first, a toast to our acquisition of a second, half plot in, front of ours.Adam’s superb Hadleigh castle blackberry wine went down exceedingly well. A nice picnic of Tasty hummus or cheese sandwiches tortillas, a few of Danielles wonderful gluten free cup cakes, is there no end to this ladies talents? And to me Gluten free = taste-full, all washed down with teas, coffees or cocoa. Now we are proudly stewarding one whole plot, with the second half we will be creating a child orientated play and learn area. Sitcommas 2016 is of to a flying start. 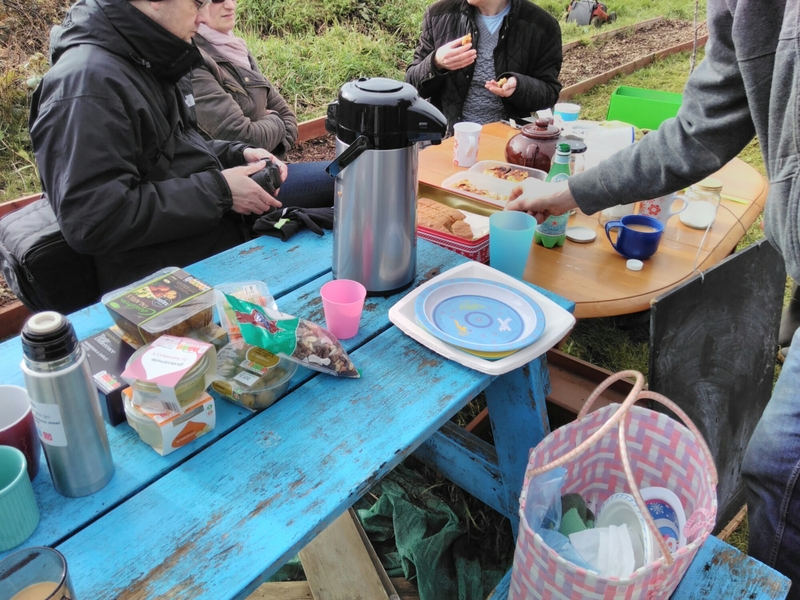 See you on the plot Saturday 9th 10-1400..
Our second official visit to the plot of 2016 saw us enjoying the first hints of Spring with the glow of warming sunshine accompanied by bird song – what a great start to the year! The warmth enabled some to shed a layer of triple winter clothing as recycled wood was moved to the site ready for plans to create a performing stage in the near future and the addition of the first few bags of a large batch of shingles to the site ready for a team effort to transport the rest in the next week or so. We used a pH testing prong as well as took soil samples in jars from various areas and combined these with water ready for testing. The children were extremely helpful in gathering these samples and labelling them accordingly, but were also specialist in discovering the woodlouse kingdom lurking beneath a slab. Well done guys! Duncan also tested his drone in order to get some aerial shots of the plot, although the batteries failed us on this occasion but show that we can blend tradition with modern technology! The first seeds of the season (basil and rocket) were planted in the greenhouse and accompany the bed planted horseradish, all of which were generously watered by the younger helpers. A spot of weeding and tidying around the plot saw the days work nearing to an end, with the children enjoying a game of swingball before sitting down to enjoy a nice cuppa and the delicious food brought along by attendees to share which included buckwheat and roasted veg salad (Alicja’s masterpiece) and fruit and nut cake (Duncan’s delight). Our friends at the the Allotment Society trading hut would also like to share some of their fine produce with you, as pictured below. 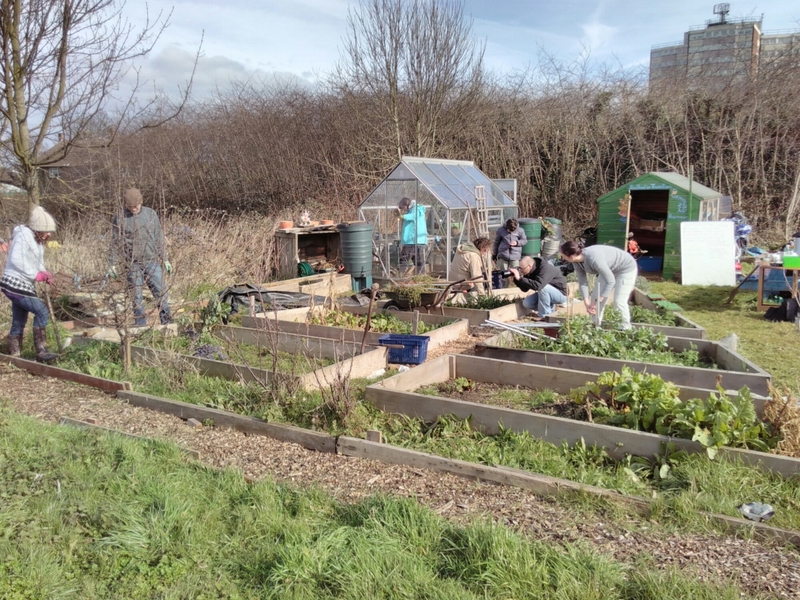 A great start to the 2016 series of community allotment open days. 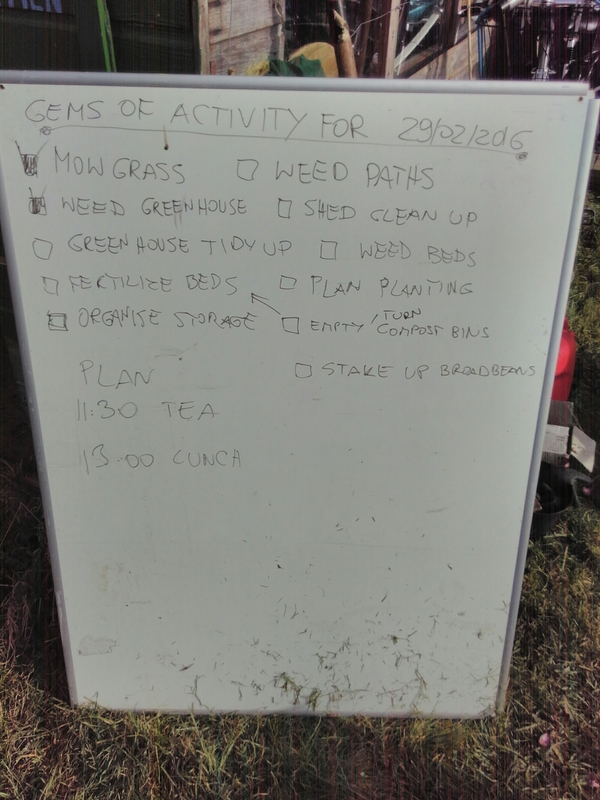 We had a good number of people who cracked on with the weeding, cutting grass, sieving compost, identifying bugs. The morning was cold initially but when the sun came out and the greens light up everyone was lifted. I could see there were a lot of conversations over the busy trowels and spades. Mark came down to take pictures for his series on Southend Soup former winners while Sherry and Gloria told us about the Connecting Communities project in Bournes Green. 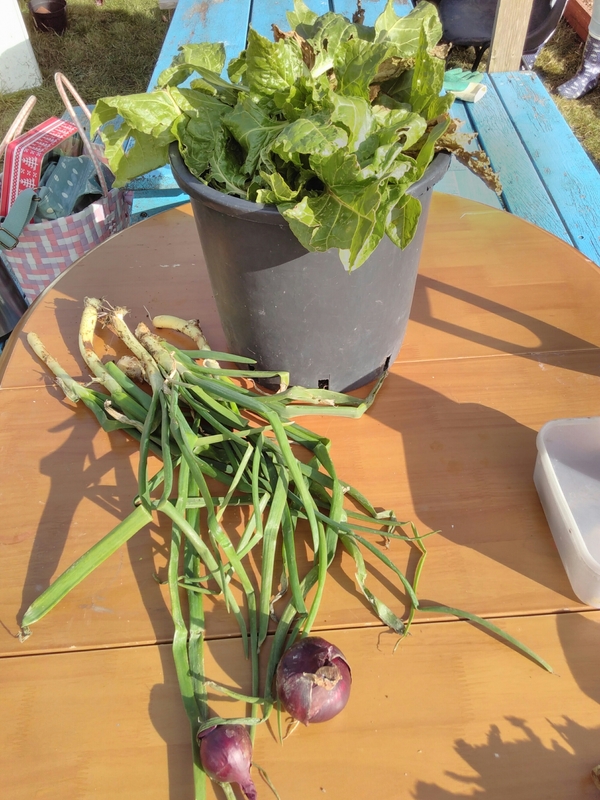 Although early in the year everyone took some chard, onion greens and onions home. Sweet fruits of our human and natures collaboration. We got a lot done – at this pace the plot will be ready for planting in no time. As we don’t like to twiddle our fingers we got permission to take on another plot which will be specially designed for families with smaller children. Having a toddler myself I know looking after them it can feel like herding cats so the plot will be designed to be secure and safe whilst allowing the care giver to sit down for a moment and have a cup of tea while their little one explores the site. See low grow beds, edible flowers, willow structures, strawberry plants, bug hotels, potting area so they can take seeds home etc. We need your ideas and designs, ways to get involved to follow soon but certainly we will need a lot of muscle power to get through the first and last digging of the plot.